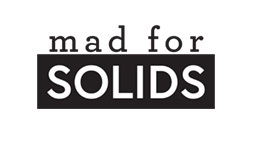 Welcome to the fifth day of voting in our Mad for Solids Bracket! Voting is open from 6 pm CDT Thursday, March 21st through 5:59 pm CDT Friday, March 22nd. Here in the central valley of California, the fruit trees are in full bloom and you see acres of orchards in beautiful colors, all the way from bright pink to white. It's a beautiful time of year. This is a collection of new spring colors. The bundle has refreshing colors like Tomato, Tangerine, Daisy, Apple & Bright Aqua. It also includes two staples like Abyss & Snow to balance out the bundle and to help extend the range of colors when used in sewing projects. Congratulations to our Game 3 winner! Peach Blossom Festival gets my vote. The peaches look good enough to eat but Re-Set got me with the bright aqua!